A slinky blouse will see you through any occasion… work, weekend lunch, wow-ing up your favourite jeans… but add a pair of city shorts? Showcasing our EDIT of the best colour and print pieces out now, the talented Rosie Day gives us the inside track on her favourite brands and how she’ll be wearing them for spring. She’s already trodden the boards in Again in the West End, co-starred with Sarah Jessica Parker in All Roads Lead to Rome, had a major role in the Golden Globe nominated Outlander and can currently be seen in Sky One’s Living The Dream opposite Phillip Glenister and Lesley Sharp. Casually add in rave reviews, 4 Best Actress awards for 2012’s thriller The Seasoning House, oh and did we mention she is one of Screen Daily’s Screen International Stars of Tomorrow? Here’s how Rosie wears it. What’s your favourite shoe brand? Dr Martens have served me well since I was 4. I’ve still kept pairs I wore when I was 13. If you only had one store to shop in, which would it be? If I had all the money in the world it would be Liberty; the atmosphere is calm and the fashion is very broad with some unique pieces. What’s the one shop you can’t walk past without going in? I love & Other Stories. Which label is in your Little Black Book? Vivetta - this brand personifies me. What do you have too many of? Coats and jackets. I only ever wear two of them but you never know when you’re going to need that bright pink jacket you bought 5 years ago. What’s your style mantra? Dress how you want to dress: you look best when you feel most comfortable. Don’t worry about what other people think of your style. And hoop earrings are ALWAYS a good idea. The post-impressionist artist Pierre Bonnard is famed for his sensitive, ‘behind the scenes’ portraits of everyday life… bathing, dressing, eating, reflecting and generally pondering nature. French to the core, he savours the domestic tranquility of red chequered tables, bowls laden with fruit, idyllic gardens and windows with streaming sunlight, but most familiar are the many nudes of his wife Marthe, bathing at her toilette. These were not painted purely for artistic expression; she suffered health issues which required hydrotherapy, so repetitive bathing was her norm. A decent bath tub would have been just as vital to her as a light filled studio was to him! 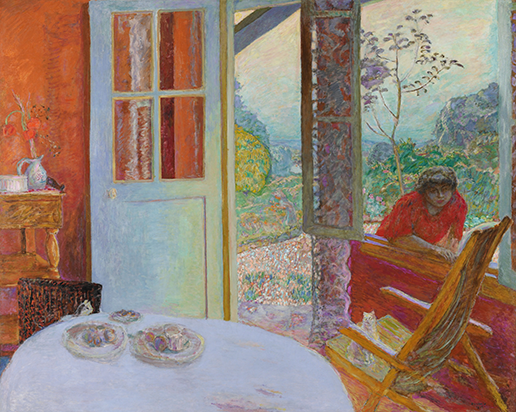 It’s the first major Bonnard exhibition in the UK in 20 years. Spanning four decades, it sensitively captures his life with Marthe, whom he lived with for thirty years before they married. Inspired by photography and often painting from memory, he sometimes started a canvas, left it for years, to return with a totally new perspective. Whatever the reason, every picture tells a loving tale and it’s one of bucolic beauty!